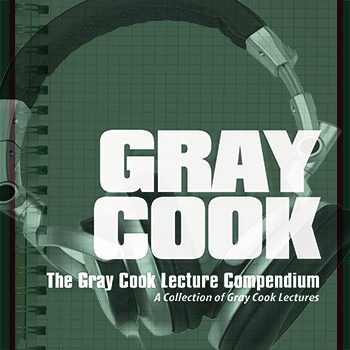 This COMPLETE Gray Cook lecture audio book includes 14 of his recent lectures covering material as diverse as what he’s looking for in the toe touch to self-limiting exercise, from lectures to physical therapy students to his general philosophy of movement. This collection is also available as an ebook, and as individual lectures. True masters of any field know that though the methods may be many, the principles are few. People who understand and have mastered fundamental principles know exactly how to get results because they’re able to avoid confusion, see the real problems underneath and know how best to fix them regardless of the situation. And when it comes to enhancing human movement, you must learn to do the same. In Three Principles You Can Apply To Any Movement, two movement masters—Functional Movement Screen co-founder Gray Cook and Titleist Performance Institute co-founder Greg Rose—distill over four decades of experience working with people across multiple sports, at multiple levels, into three principles fitness professionals can use to analyze and improve any movement, no matter how complex, no matter what sport, no matter which individual. Once you identify movement problems and categorize your training priorities,what do you do next? How do you decide where a client fits into the training continuum,and when to progress or regress? In this engaging live-event lecture, Lee Burton sets the stage for Gray Cook and Dan John to outline an efficient exercise continuum you’ll be able to immediately use in your training programs. You’ll learn about exercise choices for power, work capacity and metabolic load, evaluating movement health, competency, capacity and complexity, differences between an exercise continuum and a training progression, the minimum standards to progress, hold or regress and when to correct and when to coach. You’ve taken the FMS certification; you’ve studied the FMS exercise library. You’ve read Movement. You’ve watched the Applying the Model and Key Functional Training DVDs. Now what? How do you use the screening tool to build your training programs? In this Perform Better Summit event, FMS founders Gray Cook and Lee Burton are joined by Alwyn Cosgrove from Results Fitness, who is known for his successful client programming. Together they’ll walk you through the thinking process…from why to what to how. You’ll learn their standard operating procedure for success with your own training programs, beginning with a baseline set using the Functional Movement Screen. You may know an exercise, but that doesn’t mean you won the art of coaching it well enough to change movement. This live workshop was designed to develop your skills in four key exercises—the chop, the lift, the Turkish getup and the deadlift. These key exercises are standouts in our library of functional exercise options, and you should know them, understand them and use them. Gray and Erwan discuss self-limiting exercise, motor control, strength training, corrective strategy, and much more. Packed with live coaching sessions and demonstrations, detailed explanations, and informative discussions, see how these two experts blend the fundamental aspects of natural movement into corrective programs that create unlimited workout potential. This live workshop, filmed in HD video using four cameras, took place during Perform Better’s Long Beach pre-conference workshop, August 2011, and features Gray Cook assisted by Brett Jones. Their most recent DVDs, Kalos Sthenos, Dynami and Club Swinging Essentials, covered how to do specific exercises right. This one flips that idea and instead covers how to pick the right exercises. It’s a comprehensive 4-disc DVD set that will fill in the blanks and answer your questions about using the Functional Movement Screen when working with your clients, athletes and patients. Although different people have a variety of programming needs, we all require a baseline movement map to enhance safety and maximize results, and this workshop lays down that foundation. By using systematic logic and revisiting the natural developmental principals all infants employ as they learn to walk, run and climb, Gray forces a new look at motor learning, corrective exercise and modern conditioning practices. The following links will take you to the product information and sales page at Perform Better. This series takes the mobility and stability gained in the Kettlebell Get-Up and turns it into usable force and leverage. Develop the two best push/pull progressions for keeping your core involved in your lifts. Gray Cook, Brett Jones, and Dr. Ed Thomas explore Club swinging techniques, programming and history. Learn the art of Indian Clubs and how their speed and rhythmical actions create amazing opportunities to train posture and core stability, produce fast hands and mobile shoulders, and create new training opportunities. Can one move do it all? Can one exercise provide insight into how you move? Could one exercise be the key to achieving a balanced and strong body? Kettlebells from the Ground Up will introduce you to that exercise and provide you with all the tools you need to master this movement. The Get-up is a stability exercise without compare for the shoulder, the core and well…everything. Join Brett Jones and me for a step by step manual as we reveal the 7 steps, and workouts to get-up perfection. In this 2-DVD set Lee Burton and I provide an overview of the basic developmental sequence and how we can utilize this process to our advantage during exercise prescription for any population group. We review screens for core stability and motor control that reveal often overlooked components to function, and break down each screen into basic fundamental movements and incorporate specific corrective exercise strategies. Brett Jones and I review advanced shoulder screens that reveal often overlooked components to proper shoulder function. We break down each screen and offer corrective exercise progressions all the way to advanced strength moves. This 2-DVD set is a must if you are looking for the “outside of the box perspective” to create a mobile, stable and strong shoulder region. You will use this stuff the very next day, but you will watch it over and over. Big strength gains safely is the theme of this DVD I did with Brett Jones. Big strength comes from big movement patterns, but many exercise options are routinely overlooked. Fitness and sports trainers alike walk a fine line. They know they need to gain strength to build the best base possible, but often fall into programs with higher reps and isolated moves because they don’t know progressions and moves for safe strength gains on big movement patterns. Look no further—It’s here! “I need to limit my running”, “I don’t squat anymore because….” “My knees are shot”. These are common complaints related to knee pain in the fitness and athletic world. In this addition to the Secrets Series, Brett Jones and I reveal how to screen, and address the major contributing factor to hip and knee dysfunction. This 2-DVD set reveals a systematic approach to general screening, mobility and stability screening and corrective strategies that will lead you to return to effective exercise progressions. This book and DVD (available together at a discount, or separately) focuses on overcoming movement deficiencies to maximize training and improve performance. This methods will help you identify functional weaknesses, correct imbalances and refine sport-specific movement skills such as jumping, kicking, cutting, and turning. You will find out where conditioning breaks down and how to get your body back on track. This DVD is designed for the rehabilitation professionals (MD, PT, DC and ATC). If you use functional exercise in your practice, this DVD will enhance your effectiveness. The DVD provides insight and instruction on how to perform functional assessment on knee, ankle and shoulder. I discuss specific functional mobilizations, proprioceptive taping techniques and corrective exercises to improve movement patterns based on the weaknesses identified. This is a modified 5-point screen designed to simply identify and correct weaknesses and imbalances affecting performance. I also discuss and demonstrates exercise progressions based on fundamental movement patterns. This is designed to improve an individual’s movement patterns through easy to use home exercises using the Gray Cook Band. It provides corrective exercises and movements preparatory activities that personal trainers, strength and conditioning specialists and physical therapists can prescribe to their athletes or clients for individual workouts. # Provides instructions for Functional Movement Screening and visual reference for Trigger Point Management and Stretching for each movement screen pattern. # Easy to follow reference for Corrective Exercise Progressions. # Drills for both individual and partner techniques. # Provides corrective exercise progressions from lower level partner stretches to higher level performance enhancement techniques.